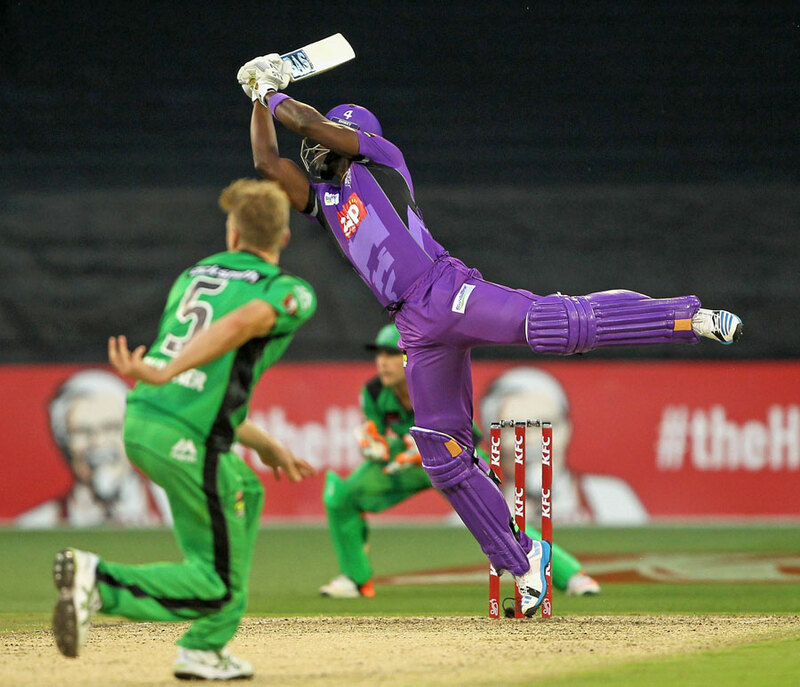 An excellent team performance from Hobart Hurricanes in their first match of the season consigned Melbourne Stars to their second straight defeat. The pressure of a steep chase of 190 got to Stars, whose strong batting order wilted against some probing bowling and eventually fell short by 52 runs. After being been put in by Stars, who brought in Daniel Worrall for Clive Rose, Hurricanes, without Travis Birt, were flattened to 3 for 31 after 5.1 overs. Their new signing Alex Hales was dismissed for a duck by Jackson Bird, before John Hastings removed Tim Paine for 19 and George Bailey for 2. Stars bowled well in the Powerplay, conceding just three fours, and deserved their success, but all three wickets came as a result of poor attacking shots as Hurricanes, perhaps encouraged by a flat MCG pitch and a deep batting order, went a little too hard. The early setbacks reduced the strategic options for Hurricanes who had no other choice but to rebuild as they exited the Powerplay. Ben Dunk, who was dropped on five by Luke Wright, and Jonathan Wells combined to produce a 90-run partnership for the fourth wicket - a new record for the Hurricanes. Captain Bailey, speaking after the match heaped praise on the pair, saying it was the "blueprint of how to play in the middle-overs of a T20." Such acclaim was perhaps slightly generous because the partnership could have been even more impressive with Dunk struggling for fluency and timing, hitting just two fours. But crucially, he fought hard, facing 42 balls for his 43. The stability of partner provided by Dunk allowed Wells to capitalise and score his third T20 fifty. But even Wells never really cut loose, striking just four fours and a single six in his innings of 68. It was a partnership characterised by proactivity and energy. However, after 12 overs with the Hurricanes at 3 for 82, their innings moved up a gear with overs of 10 and 15 runs preceding Dunk's dismissal to a mistimed pull shot in the 15th over. By the time Dunk departed, Hurricanes had been elevated to 4 for 121 with 27 balls still remaining. Twelve of those deliveries were faced by Darren Sammy, fresh from being released by Sunrisers Hyderbad, who thrashed 38 off 12 balls to propel Hurricanes towards 200 in a remarkable assault. Sammy was assisted by Evan Gulbis, who struck 14 from just five balls after Wells fell in the eighteenth over. The penultimate over bowled by Worrell was mauled for 30, including three sixes and two fours, leaving him nursing the worst figures ever recorded in the Big Bash League - 0-60 from four overs. Sammy's high back-lift, clean swing, steady head and brute force ensured 47 were collected from the final two overs and 108 from the final eight. The knock powered Hurricanes to a commanding 5 for 190. Hurricanes opened the bowling with spinner Xavier Doherty, the Stars openers Cameron White and Luke Wright were unperturbed by such a move and started strongly, scoring 30 off the first three overs. However, Wright and Kevin Pietersen fell before the Powerplay was done, both beaten by the pace of two well-targeted short balls from Joe Mennie and Ben Hilfenhaus respectively. The hopes of Stars took a further blow just two overs later when Glenn Maxwell was caught at mid-on off Hilfenhaus. Maxwell has now failed to score more than 43 for 29 T20s, and has made 19 scores of less than fifteen in a sequence of matches dating back to the middle of IPL 2014. When Maxwell fell, the required run-rate for Stars had spiralled to above ten and the chase had reached a pivotal point. The same sagacity and intelligence exhibited earlier by Dunk and Wells was required were the Stars to stay in the match long enough for the likes of James Faulkner to provide a late surge. However, an irresponsible shot from David Hussey, charging leg-spinner Cameron Boyce and failing to get to the pitch of the delivery, saw him fall for 11 and any realistic chance of a victory for Stars receded when White fell soon after for a stoic 62. As the seagulls gathered, the rate climbed, the balls dripped away and the MCG slowly emptied, the Stars lower order crumbled at the hands of Hilfenhaus (4 for 27) and Mennie (3 for 20), who completed an encouraging victory for Hurricanes.